Joan Wagner, 82, of Seaforth, MN, passed away on Tuesday, November 6, 2018 at the Wabasso Rehabilitation & Healthcare Center in Wabasso. Mass of Christian Burial will be 10:30 AM on Saturday, November 10, 2018 at St. Mary’s Catholic Church in Seaforth. Visitation will be from 2-6 PM on Friday at St. Mary’s in Seaforth with prayer service and rosary at 5:30 PM and will continue one hour prior to the service at the church on Saturday. Interment will be in the church cemetery. Online condolences may be placed at www.sunsetfuneralassociation.com. The Sunset Funeral & Cremation Association is caring for the family. Joan Lorraine (Soupir) Wagner was born on January 15, 1936 to Anthony “Tony” P. and Marie “Sadie” (Zollner) Soupir in Wabasso, Minnesota, Redwood County. She was baptized and confirmed at Our Lady of Victory Catholic Church in Lucan. On August 10, 1955, Joan was united in marriage to Gerald “Jerry” Wagner at St. Anne’s Catholic Church in Wabasso. They made their home on a farm near Vesta until 1961 when they moved to their present homestead 3 miles east of Seaforth. Joan was a farmer’s wife and mother of 10 children. She cooked at the Wabasso Senior Dining for over 20 years. 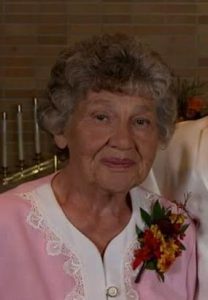 She was active with St. Mary’s CCW, Seaforth and Wabasso American Legion Auxiliary for over 50 years, Seaforth Booster Club, Extension Club, Girl’s Club and Card Club. Joan enjoyed spending time with family and the grandkids, cooking, baking, gardening, flowers, canning, raising deer and had a love for farm animals and wildlife. On Tuesday, November 6, 2018, Joan passed away at the Wabasso Rehabilitation & Healthcare Center in Wabasso at the age of 82. She is survived by her children David (Molly) Wagner of Wabasso, Marty Ross of Granite Falls, Jane Rechtzigel of Osakis, Carole (Mike) Remiger of Wabasso, Gail (Tim) Woelfel of Redwood Falls, Colleen (Joe) Remiger of Wabasso, Mary (Brian) Erickson of Montevideo, Jean Nelson of Slayton and Joel (Val) Wagner of Redwood Falls; 29 grandchildren, 26 great grandchildren and 1 great-great grandchild; and sister Dolores “Dee” (Hal) Kravig. She was preceded in death by her husband Gerald “Jerry” Wagner, her parents, children Pat Ebner, siblings Robert “Bob” Soupir, and Larry Soupir, grandson Gabriel Ross and son-in-law Mark Nelson.